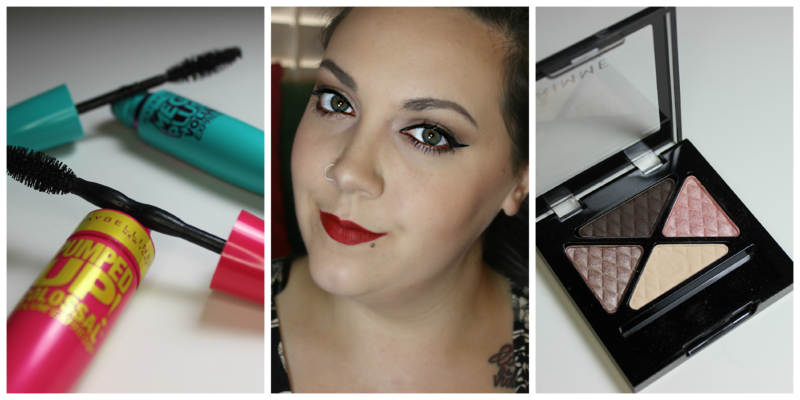 It's time for another Just Save July post and this one is all about the eyes and lips. A lot of the time drugstore/high-street eye shadows are over looked for high-end palettes and mostly that is because, in my experience, they're just not formulated as well. They're either chalky or they just aren't pigmented very well at all. 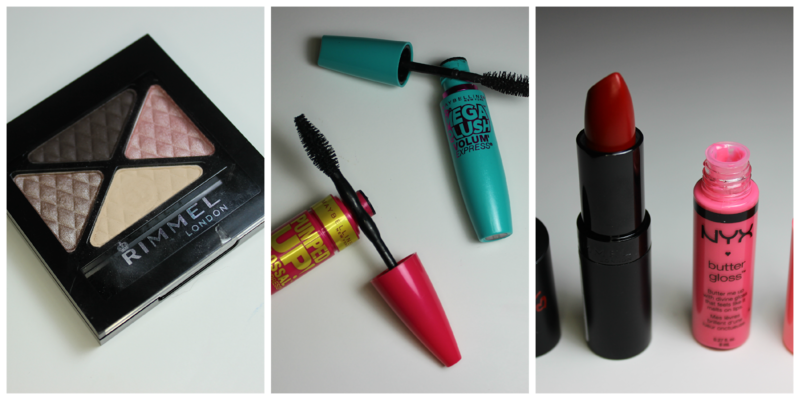 Now, mascaras, on the other hand, get all their due and are nearly, if not as good, as more expensive options out there. The beauty in drugstore makeup is they have mad sales, so you'll notice this post has a lot of Rimmel and Maybelline, which happen to be two of my favorite drugstore brands. All the prices listed are without the sale price. I picked this up when I saw one of the shades was wildly close to MAC's Satin Taupe. It's not as pigmented but it does the trick and is half the price for all four shades. The mattes are a bit chalky, but they can be worked with and I quite like them and I have used this quad out side of just testing it for this post. I like this mascara. I'm not over the moon with it, but I would repurchase this. It gives a lot of length and volume it's just not as black as I'd like for being the darkest shade they make and after about five hours it has some fall out, which is easily dusted away with a poder brush. This is one of my favorite drugstore mascaras because it gives your lashes a fluffy natural volumizing effect. I get the brown/black shade to really play that natural look up. This is my third tube. This gel liner was pretty good, I think Maybelline make a more matte, pigmented version, but it's not as user friendly. The line came with a brush that I found to be useless in creating a cat eye so I instead used a Real Techniques Liner Brush $5.98 on Amazon and that got the job done. This blue under toned, classic red is the perfect drugstore option if you want to do a pin-up look or just a pop of color. It has a satin finish that I made matte by pressing some finishing powder on top to set it so it wouldn't wander as it bled without doing either that or lining the lips. This is probably one of the most blogged about gloss formulas out there. It's non sticky and smells amazing and I normally hate lip products with smells, because they make me feel a bit sickly.The glosses name explains the color and it looks amazing with a smokey eye or on a natural day with just a few coats of mascara. budget friendly makeup hunt. I am having a lot of fun with this just save July and I am looking forward to the upcoming post on blush! I actually got so many shades I'm giving these babies their own post so feel free to follow my blog, Instagram, Twitter or Tumblr for updates on future post. Thank you for reading, each one of you mean so much to me as cheese-tastic as that sounds, it's true.